We contacted Strutt Your Mutt because our black lab, Finn, was out of control. Finn had difficulty socializing with other people and dogs similar to how a person with autism might socialize. She also exhibited a lot of anxiety and had a high prey drive. We could not walk her on a leash, take her out into public under control, or ask her to come when called reliably. Before we contacted SYM, we had a terrible experience with another trainer in town and we were in tears when we quit and walked out of our final training session. We crated Finn in the back of the car and felt hopeless as we were driving home. Since we have been training with Strutt Your Mutt, we have all the tools and information we need to help with Finn’s behaviors and our relationship with her. Had we not been provided the coping mechanisms as well as the insight into Finn’s behaviors, we might have gotten a divorce or I would be on Prozac. As a result of our training with Strutt Your Mutt, we can now read Finn like a book. We can see Finn’s anxiety building and know how to react if it gets too far or even how to prevent it before it escalates. We now understand the proper way to deal with her high prey drive and the proper type of exercise to lessen her prey drive. Even learning how to pet Finn so as to not amp her up has changed her. Finn can come to the office now and that is rewarding, it was one of the goals we had for her. She doesn’t take the advantage of us like she did before. We used to battle it out and now she sees both of us leaders. We can watch hours of Netflix and Finn is on her place and happy to not roam or bug the crap out of us. She sits on her place at dinner and overall is a joy to have in the home. The basic commands Finn knows are literally a life saver. Sitting at a door to wait to go out, the here (heel) command, the place command, and her recall (coming when called) are so well engrained in her that they come naturally. It was fun this past weekend to see a three-year old that was visiting us tell Finn to sit, let’s go, and place, and Finn listened to the little girl. Finn even let the little girl lead her on the leash, and Finn was patient and did not pull. We are still amazed! Finn needed a leader and a human to give her the guidance to help her maneuver life and life situations. We fear, without us, she could have been hit by a car or run away. Her recall is likely the best we have ever seen in a dog. She can hike with us and we have not a single fear of her not coming back. She is able to have a bit of freedom that she can handle which gives her more and more confidence. She trusts and respects us and no longer battles us. We recommend Strutt your Mutt and sing their praises all the time. We do always tell people though, they have to do the hard work and follow Erika’s advice or else the training isn’t as effective. We are so glad we followed the program and made the commitment. I think my husband, as well as myself and Finn, are different and better humans and canines as a result of training with Strutt Your Mutt. My husband and I adopted red heeler mix litter mates from a shelter in Glenwood. For the first year or so that we had the dogs, my husband and I lived apart, which meant the dogs lived apart. They only saw each other on weekends, which didn’t allow them to pack up too much. 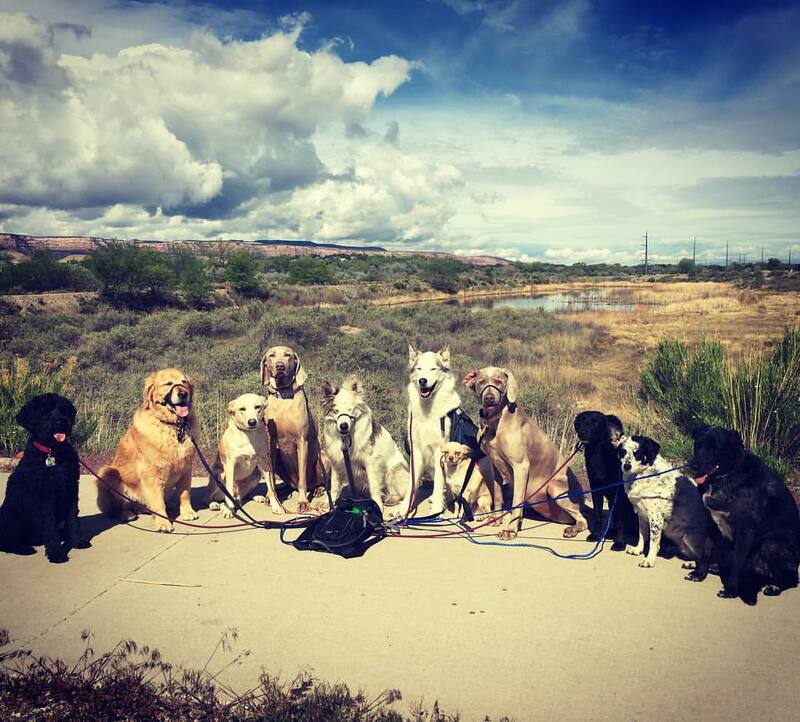 However, when my husband moved her to Fruita, of course, bringing the other dog with him, they started to develop a pack that was hard to control. The most difficult part of their behavior was their aggression toward other dogs. They never drew blood or anything like that, but anytime another dog got anywhere near them, they went into attack mode. My husband and I are avid outdoor people, so it was important to us for our dogs to be able to go with us on hikes, river trips, etc. We had a trip planned to spend the summer in Alaska and knew we needed some tools to help control the dogs. I had tried another training program with “my dog, Lex” at one of the chain pet stores in town. The training was more focused on rewards, rather than understanding and correcting their behavior. At the end of the training, I felt like I could get Lex to do lots of commands (sit, stay, lay down), but I didn’t feel like it worked on his behavior around other dogs at all. Fortunately, we heard of Erika and Strutt Your Mutt from the Hot Tomato owners here in Fruita. Our first meeting with Erika helped us to see that not only did the dogs’ behavior have to change, but ours did also. I remember her asking us what our rules were. We looked at each other and decided we didn’t really have any rules. In hind sight, the dogs ran our household. She told us our dogs were not necessarily aggressive, but were extremely insecure, which came out through uncertainty when other dogs approached. Rather than continue to foster their insecurity, we had to treat them in a manner that would eventually encourage them to stand on their own and eventually relying on us as the pack leader. So, after our first meeting, we had to change a lot of our behaviors in order to change their behavior. Our dogs didn’t become “super dogs” overnight. The changes we made seemed small at first, but collectively, they made a huge difference. We continued our training sessions with her. We had a fairly difficult case with having males, that are brothers, and throwing the Red Heeler breed into the mix. The dogs improved tremendously, especially with my husband. However, I continued to struggle with one of the two dogs (Lex). I definitely don’t have a dominant personality, so Lex continued to dominate my time with him. Erika and I made the decision to do a two week board and train with him. Before I committed to the board and train, I was concerned with the price tag. However, after getting him back, it was probably one of the best purchases I’ve ever made. He came back a different dog. He was so much calmer. He no longer continually pulls on the leash. He can socialize with other dogs under the right conditions. He is more obedient. He seems to be more eager to please. We learned that he actually has a very playful side. It definitely has been and continues to be a work in progress. Her program is also one that you have to commit to and practice with consistency. If you don’t do the work, you won’t see the results. We work our dogs at least once a day, and most days twice. They also get at least one form of exercise each day (hiking, biking, etc.) It’s definitely not a lazy way of training, but it’s a way of training that gets results. It’s as much as changing your behavior as it is the dogs’. Probably, the thing I most like about Strutt Your Mutt is that I feel she is committed to whatever it takes to get the job done. If one way didn’t work to get Lex under control, she would show me a different way. On numerous occasions, I have called and texted her with questions. She is always quick to respond with an answer and a lot of times just to encourage me to continue the work. I highly recommend Erika and Strutt Your Mutt. If you want to be happier with your dog, she’s your “go to” person. The following statement is from the first email I sent to Strutt Your Mutt back in June of 2016. I'm very interested in working with you to learn how to make my "good" dog a "great" one! I'm just not sure how we begin! ​I mentioned help with leash walking without pulling and coming when called. Here it is December 2016 and I’m here to tell you I got so much more than that!! Buffy was a stray found in Texas in December 2015, and she was delivered to me in early May 2016. She’s a hound dog mix with a sweet sole but a stubborn streak a mile wide. At the time I contacted Strutt Your Mutt, I thought her “listening issues” were because I had no clue “how” to get her to listen. Although that was true, there was more to it than just me. Erika, Buffy, and I had our first session in mid-July. We went on to have a few private sessions with success, but it was a slow process. In the process of scheduling additional sessions after Buffy's boarding experience, Erika mentioned her board and train program. She explained the two week program would “jump-start” Buffy’s training and get us to our goal sooner. Buffy would learn to leash walk, come when called, and much, much more. I thought about this option and said, “why not?”. Buffy attended Strutt Your Mutt's board and train program in late October. The board and train program Strutt Your Mutt offers is the best thing I’ve ever done for a dog (and my relationship with a dog). BEST MONEY I’VE EVER SPENT!! The training provided by Strutt Your Mutt was tailored not only for my dog’s personality, but for mine as well. We continue to work with Strutt Your Mutt, because I want to continue to fine tune what we’ve learned and continue to learn more. Do you want a dog that listens to you? Do you want a dog that is calm in every situation? Do you want a support team that is there for you? Do you want live in harmony with your dog and know your dog is happy and balanced? Strutt Your Mutt can help. I've told a lot of people that the Strutt Your Mutt program works!!! I have never experienced so much JOY with a dog before!!! I'm singing the praises of Strutt Your Mutt to anyone who asks (and some that don't). For me, the hardest part was trusting that their method would work and letting go of old ideas. Once you go to work with Strutt Your Mutt and you make a commitment to work the "plan" they set up for you, you will be given all you need to have the dog you have always wanted. The other dog owners and dogs will envy the wonderful relationship you have with your dog! I met Bella, my three year old Corgi/Jack Russell mix, when she was just over a year old and was being fostered by my sister. She had been surrendered by her first family and had been through two shelters and another foster. I thought that she was a pretty high energy dog, but she seemed to get along with my ten year old Border Collie/Australian Shepherd, so I adopted her. I realized that we would need some training so Bella and I went through two different obedience courses with 14 weeks of training altogether. While we were pretty successful at mastering the basics of sit, come, and stay, there was one issue that just kept getting worse. When I would try to leave the house with Bella to go for a walk, out to potty, or even by myself to take out the trash, she would "freak out". There was this really high pitched barking (sounding like she was hyperventilating) jumping up on me, nipping at my hands, and tearing at my clothes. This behavior only happened at home, never at obedience class, so although her trainer offered a lot of suggestions, nothing seemed to help. Over the next year I tried bark collars, sonic dog whistles, training books and videos and was convinced that I too would have to surrender Bella back to a shelter. Fortunately, my sister heard about Strutt Your Mutt and suggested I contact Erika. I described our problem to Erika and she agreed to come to our home and work with us. It was such a relief to have someone else witness Bella's behavior and be able to take control of Bella and the situation we were in. Erika helped me to see that the issue was not just Bella's but also my reaction to her. I was unaware of how my tension was feeding Bella's anxieties and that I was going to have to change my behavior if I expected Bella to change hers. After a couple of sessions, Erika suggested a "Board & Train" at her facility so that she could work with Bella one on one, and then with me to create a new relationship for Bella and I. I must admit that I was nervous about leaving Bella, but when I arrived for our first joint training session after a week into Bella's board and train, and I saw the progress that Erika had made with Bella, I was so impressed. I felt that there was hope for Bella and I after all. It has been a few months since Bella's board and train, and during that time Bella has become a very different dog and we have a much better relationship. Now, when we do a training session with Erika, Bella and I work as a team, trusting one another. We are both much more relaxed and Bella is much more happy and calm these days. I can even go through my doors with no more biting and my clothes are safe. I feel that Erika has helped me to find the sweet, funny dog that was inside Bella. Bella has become the good companion I was looking for when I adopted her. I would definitely recommend Strutt Your Mutt to any dog owner experiencing behavioral problems with their dogs. Erika has made such a difference in our household and our lives. ​Bringing Jipsy home was not an event our family took lightly. We had carefully calculated when to have new member join our family, spent more than a week at the shelter getting to know her and had carefully counted the additional expenses we would incur. When the shelter told us "No pets, No Kids," we didn't ignore them, but we also felt that with the proper boundaries, training and situation, a dog is not tied to its labels. Jipsy came home and was a shining star. She has never had an accident in the house, I have only lost 1 pair of shoes, and she is able to be left alone for 8 hours during busy work days. Jipsy was introduced to our neighbors and friends and did wonderfully with adults and kids alike. We truly have an amazing 3 year old rescue. Unfortunately, then we ran into other dogs. Jipsy was "aggressive" and she could not behave around other dogs. We also started having problems walking and running on a leash. So at the recommendation of others, we met with a local dog trainer who gave us lots of direction and advise on working with Jipsy; the training was based on rewarding good behavior with food/treats and ignoring bad behavior. This training worked well for about 15 minutes. But when Jipsy was full from treats, she was no longer interested in listening or behaving. And when we ignored her bad behavior, she assumed we were just like the other 4 families that had adopted her in the previous 14 months. She had no reason to respect us or listen to us. Needless to say, we started looking into other dog training options and really connected with the Cesar Milan "Dog Whisperer" theory of dog training. So we read one of his books and watched some videos, but struggled with implementing his system. Then, out of sheer luck, I was running at Sherwood Park (without Jipsy who couldn't be trusted in an area so full of dogs) and spotted the most impressive pack walk of 8 dogs I had ever seen. Erika Hall with Strutt Your Mutt was walking 8 dogs all trailing behind her, all behaving appropriately and all concentrated on walking; no sniffing, no pulling, no aggression. I was in awe and knew that there was hope for Jipsy. During our first lesson, Erika came to the house with a $0.25 piece of rope and proceeded to walk Jipsy in a calm and appropriate fashion within 10 minutes. We were in shock. Then she took Jipsy, along with her personal training dogs Penny and Teak, on a walk together. We seriously could not believe our eyes. No one came back bloody, missing fur, or even anxious. Our "dog aggressive" dog had hope! While I would like to say Jipsy was perfectly friendly with all other dogs from that day forward, it's not true. She has required daily training at home to maintain the pack mentality and continued training with Erika, Penny and Teak. She is learning to socialize appropriately, pack behavior, and dominance reimforcment every day. Erika told us 2 months ago that the little thing we were doing would become second nature and wouldn't be "work," but I thought she was crazy. Today, Jipsy waits to let everyone else go through doors first, doesn't jump in the car unless told to, and knows that she belongs in her bed when we are eating dinner. After three months into training, Jipsy can run or walk anywhere without me worrying what will happen with other dogs or people. She knows who is in charge, how to behave appropriately in public around other dogs, and knows she is to stay right at my side when on leash. We even walked into a major pet store this week, an accomplishment for us both! Jipsy has gotten to know Penny and Teak very well and the three of them can be left alone, unsupervised without concern for any "dog aggression." We were even able to use our skills on my brother in law's unruly two year old chocolate lab named Claire. With only a $0.25 piece of rope and five minutes, Jipsy and Claire were walking side by side, under control, and without any attempts at aggression. It was a testament to the knowledge and training we have gained from Strutt Your Mutt. If you're interested in being the leader of your pack and helping your dog behave and live a better life, you can't go wrong with Strutt Your Mutt! Our dog Alpine was having severe separation anxiety. She was on Prozac and an anxiety medication. She had broken through two kennels, scratched up two different entryways and figured out how to open the garage door. She chewed up shoes & books and got into the garbage. She would poop and pee on the floor even if left alone for a couple a minutes. We had to take her everywhere and leave her in the car. It seemed to be the only place where her anxiety didn’t get the best of her. My husband was frustrated with having to make repairs and wanted to get rid of the dog. Strutt Your Mutt was a last ditch effort for us. Alpine has been with Strutt Your Mutt, LLC twice a week since the middle of February. We were asked to stop the meds Alpine was on so Erika could see what she was dealing with. Once we began Erika’s services, I started to see a change in Alpine almost immediately. In less than two months, we have been able to leave Alpine alone in the house for 12 hours and nothing is destroyed nor are there any messes to clean up when we get home. Alpine is a totally different dog now. Her anxiety issues are improved, we can walk Alpine and not have her pull and drag us down the street and she’s much more relaxed at home instead of pacing and licking all the time. We are very satisfied with the service we’ve received from Strutt Your Mutt. Alpine knows what days she gets to go to Erika’s house. On those days, she follows me everywhere so she doesn’t get left behind. By the time I’m ready to leave the house, she’s running in circles and barking. When we get to Erika’s, she jumps out of the car and goes straight into the house without me holding the leash. I can’t say enough about Erika. She is very professional and dedicated. She’s a great resource for things that may seem trivial. Overall, I think she’s the best and it’s nice knowing that I’m leaving Alpine with someone who may just love my dog as much as I do. I think in addition to the work that Erika has done, I think it’s helped Alpine being with other dogs and seeing how they react when left alone. Because of Strutt Your Mutt, I get to keep my dog. ​I contacted Strutt Your Mutt (SYM) for help dealing with our dog Ruby’s aggressive behavior toward other dogs. She was at that time a 2-year-old lab mix we had adopted from the shelter at age 1. We had worked with another trainer in town with some success, but Ruby was still growling and often lunging whenever we’d pass other dogs – behind fences, on leashes or running loose (Ruby is ALWAYS on a leash). SYM’s Erika worked with me as I walked Ruby around our neighborhood. After a single working session there was a dramatic change in Ruby’s behavior when we would pass other dogs: instead of the predictable growling and rearing up and lunging she could get past with only nervous prancing and some “humming”. This huge difference was a direct result of Erika’s teaching methods. We continued sessions 2-3 times a month until I better understood how to manage various dog encounters, and improved my technique with the method. At this point (after 7 sessions total) Ruby can often pass other dogs with only quick, sidelong glances – although sometimes she will still be antsy or growl, especially when off-leash dogs come right up to her. (And how rude is that?!) I do anticipate asking Erika for a few more sessions once I recover from a recent surgery. Ruby now also attends doggy day care at SYM once a week, and she loves it. She comes home tired and happy after spending the day with a group of SYM dogs, all maintained in a balanced state of mind by this exceptionally talented young woman. I highly recommend Strutt Your Mutt and Erika to anyone seeking help with their dog’s behavior. I have praised her services to my dog-owning friends and co-workers, as well as to our veterinarian. We first got in touch with Strutt Your Mutt, LLC for help with training our new German Shepherd puppy. Our older dogs, an 8 year old Labrador and 5 year old Beagle, were mostly well behaved but they had a few bad habits that we didn’t want the puppy learning (e.g. jumping on the couch with muddy feet, dragging us on walks, and running toward other people/dogs passing by). We joined the Strutt Your Mutt classes at Chow Down and our life has been forever changed. With the small class size, Erika and Lexie were able to give us individual attention and guidance. Erika taught us the psychology behind bad behavior and how we could correct the root cause of the problem by changing a few of our daily routines. Our #1 priority was to be able to politely walk all 3 dogs in a heel. I am proud to say that after applying the methods we learned in class and working with Erika for just 2 private lessons, we are now able to pack walk! We see progress with our pack every day, but continue to consult with Erika when new problems arise. Our relationship with our dogs is better than we could have ever imagined, and we are living a more healthy and balanced life together. I recommend Erika to everyone I know. ​My husband and I have been to several trainers for our dog with little success. We just wanted to walk our dog without him pulling us. In addition, our dog Cooper was barking at people walking in front of our house and whining when other dogs were close by. We both had seen Erika around the neighborhood walking several dogs (6 to 7!) and they were all calm and submissive. We knew we had to find this person and see what her secret was! Fortunately, we were able to find her on the internet, otherwise we would have hunted the neighborhood to find her. She was prompt and professional and came to our aid immediately with instant results. Erika was very helpful and answered all of our questions in a professional manner. She gave us multiple ideas on how to handle any issue and really took the time to understand our dog and what his needs are. We have used Strutt Your Mutt on a regular basis for behavioral issues, dog walking and boarding and have been very pleased with our happy, obedient dog. Cooper is a more calm, relaxed and balanced dog, and learning the skills to be pack leader has been a great success for our family. Erika is a huge asset in our family and we hope to continue this relationship for a very long time to come!